Heads-up lasted all of five hands, as I was out-chipped 4-1 and out-flopped by trip queens. But heck, not a bad run. 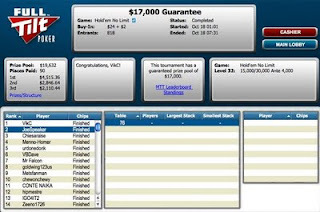 Kudos as well to fellow blogger VBDave and his final Table finish. My poker game is better than my soccer coaching, I assure you.